Happy Thanksgiving!! This year we're giving thanks for a healthy little baby girl growing inside of me, and thanks for the other two new baby girls in our family! For Thanksgiving, Jeff and I typically have two big dinners in one day! Jeff's dad's family always celebrates Thanksgiving in the morning with the big meal around 11, so we're headed out to the suburbs bright and early this morning. Some of the unique things they do is always eating shrimp cocktail as an app with the biggest shrimp they can find (yes, it's a competition!) at, yes, 9am, and then his uncle always carves the steaming hot turkey with his hands. Yes. It's quite a feat to see. After we eat, the family always dives right into Christmas with a name draw for their Secret Santa. Everyone over the age of 21 and at least engaged to someone in the family participates, and they separate by men and women. For the first couple of years, I drew the same name every year for Jeff's cousin's wife who I didn't actually meet until our wedding - always fun to get a present for someone you don't know haha. Actually, this will be the sixth time I've participated and I think I've drawn her name four times!! After seeing Jeff's family, we're headed up to my grandma's house for a giant dinner. I'm pretty sure she said 30 people would be there this year! It's always fun to hit my grandma's because she'll have completely decked out her house for Christmas already, and she goes all out. I'm talking giant life-size nutcrackers, a tree in just about every room, and a fleet of Santa Clauses out in the backyard. Be sure to check my InstaStories today, I'll try to share a bit! I mean, they're cozy, they're festive, and they basically hide your entire body so that food baby stays under wraps! 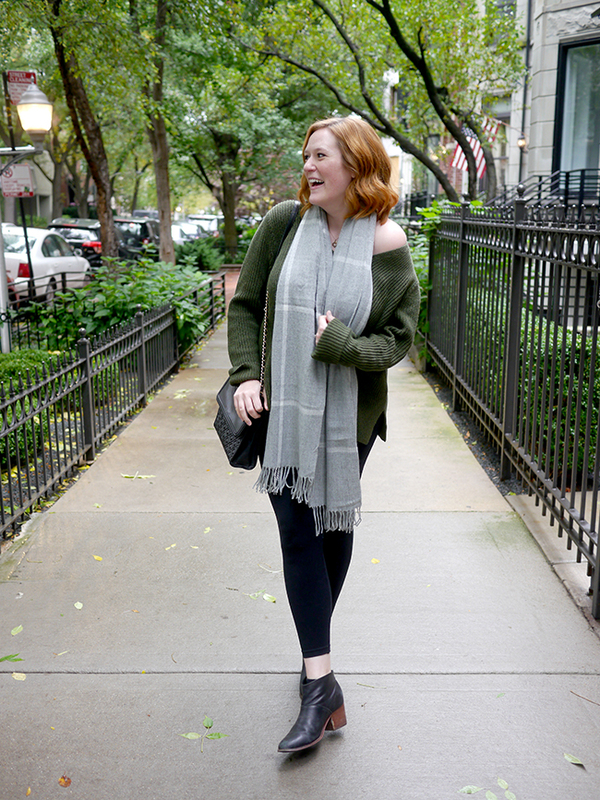 Plus, when it's time for the inevitable post-dinner nap, you're already wearing a blanket ;) Pair it with a tee and jeans for a more casual look, or a sweater and faux leather leggings to at least look like you're a little dressed up! Thank goodness shift dresses are in style right now, am I right?! I mean, they're so comfortable - and if you're pregnant like me, super bump friendly! If you aren't pregnant, super food baby friendly haha. I would just add tights to either of these and skip the sandals since it's been so cold, and you're good to go! 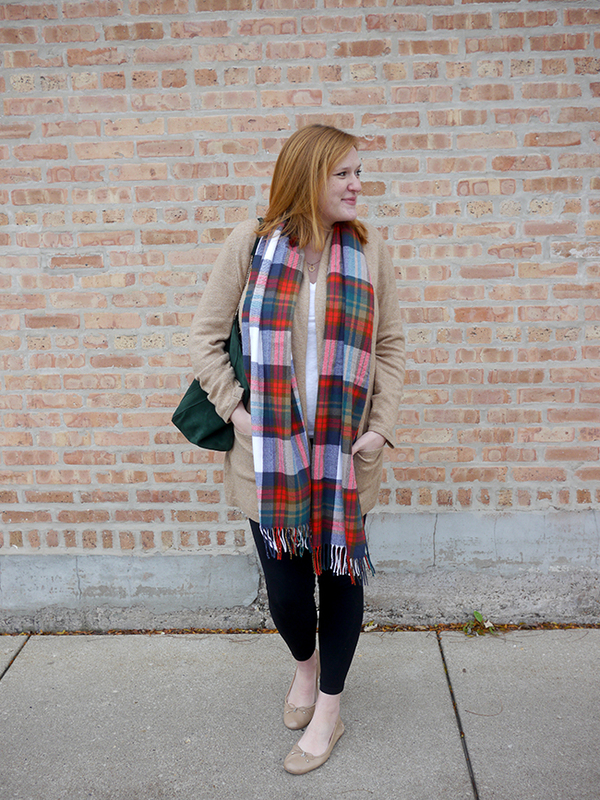 Just adding a hint of plaid to your outfit just makes it feel so fall, and makes it that much more cozy! I love adding them on top of a sweater to make it just a little more festive and visually interesting. I hope you have a very happy Thanksgiving! !